“What do you have against orange pumpkins, Mama?” my daughter asked as we slathered blue latex all over the orange plastic. 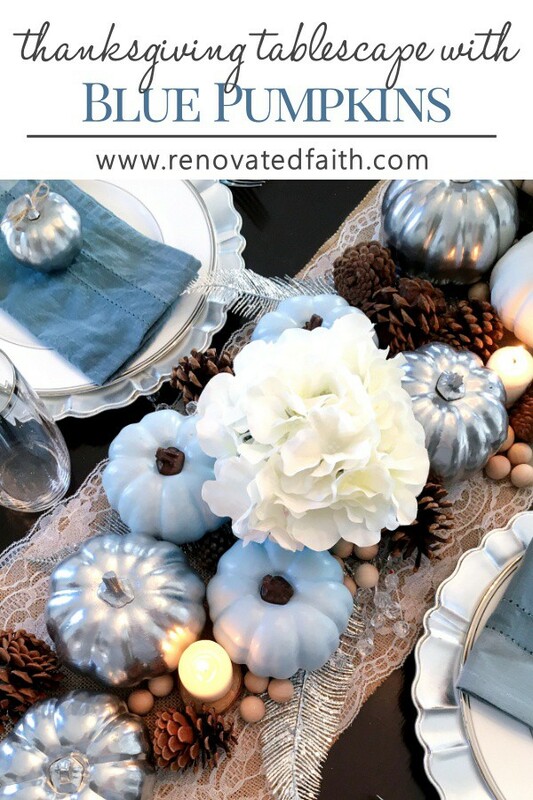 My DIY Thanksgiving tablescape helped me to remember that life doesn’t always give us orange pumpkins but we can be confident that God will still bless us through the unexpected. I’ve just never been a fan of orange personally. Maybe it’s because most of my house has blue décor. Or maybe it’s the fact that I’m a Texas Aggie and our long-time rival‘s color is burnt orange. But these days orange is just “NOT my color”, as my daughter Morgan would say. 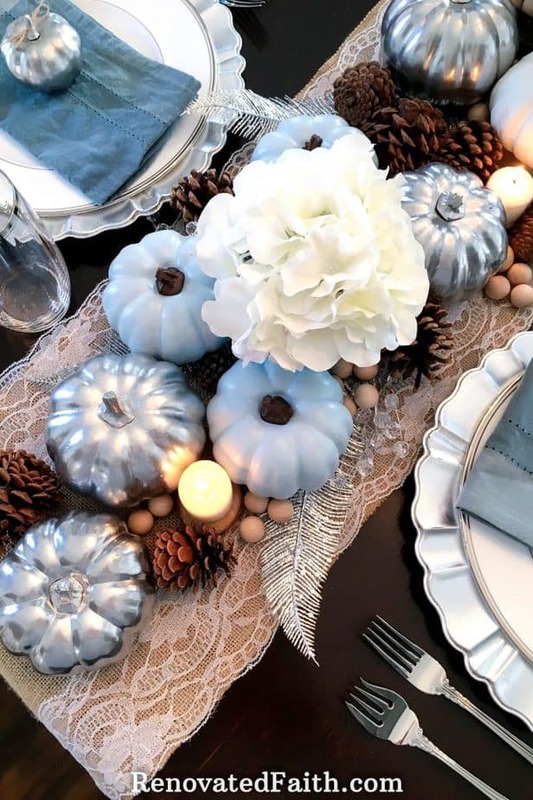 When I pictured our Thanksgiving table I thought blue pumpkins would mesh well with the classy white and silver pumpkins we spray painted last year. 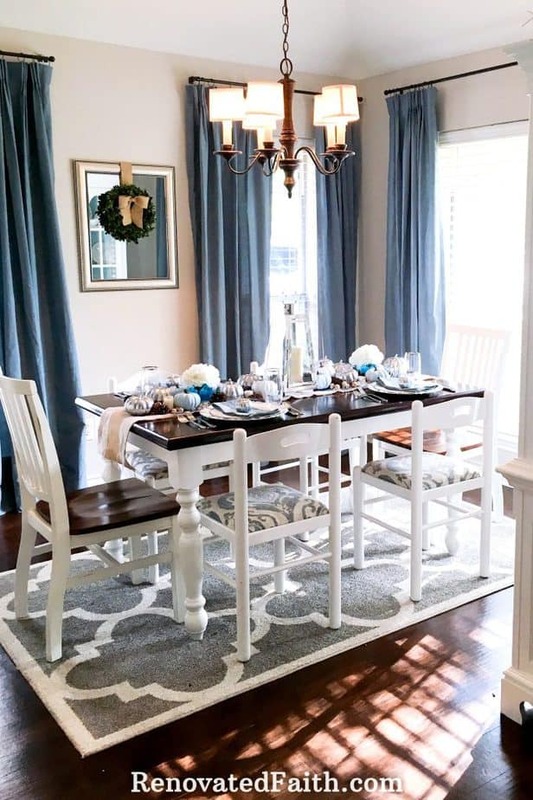 Sometimes you just need that extra pop of color to set everything off – which I’ve realized is not only true in dining room decor. Growing up, we decorated our home with orange pumpkins just like everyone else did. They were the expected and familiar staple of our Thanksgiving décor. I’ve never been a fan of change but recently I’ve realized how many of life’s blessings first come to us an unexpected changes. Before Morgan was born, I worked in a large church where my full-time job was to oversee Home Groups, Sunday School and later on Women’s Ministry. Hours of seminary classes (91 of them to be exact) prepared me for that job. The role of Adult Education Director became familiar and comfortable, like that favorite pair of running shoes that you’ve finally worn in. However, to my dismay, every part-time church job and even some volunteer opportunities fell through. Filled with shame and frustration, I continually sought out and fought with all my might for the “orange pumpkin” I was so accustomed to. “What do you mean ‘no’? This is what I’m trained for. This is how you’ve always used me in the past…” I kept looking all around me for my comfortable and familiar orange pumpkin while I was ignoring the big blue pumpkin sitting in my lap. Then something bizarre began to happen. In my time with God, through friends and family, and even random circumstances I began to get ideas for blog posts. There was only one problem…. I didn’t have any blog or any plans to start one. In Romans 15, we see that Paul’s initial ministry was to the Jews but later God called him to the Gentiles (non-Jews) as His primary long-term mission field. Before Paul’s conversion, he was a Pharisee among Pharisees who he had studied all his life under Gamaliel, one of the premier teachers of Judaism at the time. I don’t know about you, but to me this doesn’t sound like a guy that is questioning God’s change of course. His confidence in God’s plans are palpable and His desire to move forward in God’s new direction is unmistakable. Instead of questioning a major pivot point, Paul rested in the fact that God is a finisher. He always carries out His work in us until it is complete, especially the work He’s done in us (Romans 8:28). No matter how ‘out of the blue’ His plans may seem, they are no surprise to Him. In fact, He has carefully crafted a plan for your life – plans far better than you could have ever imagined. As Timothy Keller says in his book Every Good Endeavor, “Our job is to serve the work that has been given to us by the Father. God is fully aware of where you are at any moment. By serving the work you’ve been given you are serving Him.” Life’s pivot points have not emerged by accident. God is merely working out the plans He’s had for you since the beginning of time. The reality is that sometimes life gives us blue pumpkins. However, we can rest in knowing that although life’s unanticipated events undo us at times, they have always been on His radar. He works all things for His glory, and therefore, our own best interest. (The Blessing of ‘No’). Our Heavenly Father works all things for the good of those who love Him (Romans 8:28, 29). Our former path is never wasted but is sometimes used in a completely different manner then we anticipated. God uses our former training, preparation and experiences in ways we could have never dreamed possible. It took me a while to settle into this new role as a blogger. I feel completely insufficient and ill-equipped. 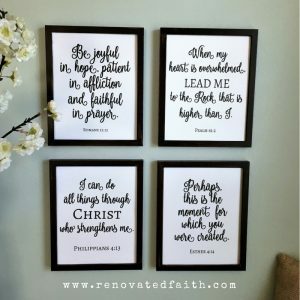 Ironically, my feelings of inadequacy help me to lean into Him even more, knowing I have nothing to give of myself (Why You Struggle To Rest In Him). Usually that first step in a new direction is the hardest one. What blue pumpkin have you been handed? Are you struggling to let go of your former plans? As I sit here typing, I am so relieved that my original plans didn’t fall into place. God gave me a tremendous opportunity to grow through this blog. God wants to transform our hearts to be more and more like Him and I’m excited about this new calling. I never pictured myself here, but I’m thankful that God saved me from my own plans. God prepares us for new seasons of life but in ways we never would have expected. Rest in Him, friend. Before long you will abandon your orange pumpkins knowing the new freedom of following plans too beautiful to imagine. 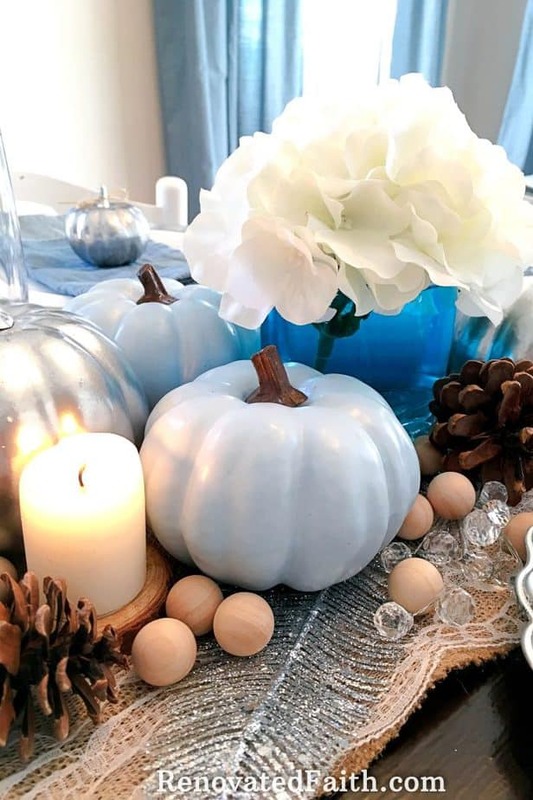 My Thanksgiving Tablescape with Blue Pumpkins allows you to have a different twist on traditional thanksgiving table centerpieces. 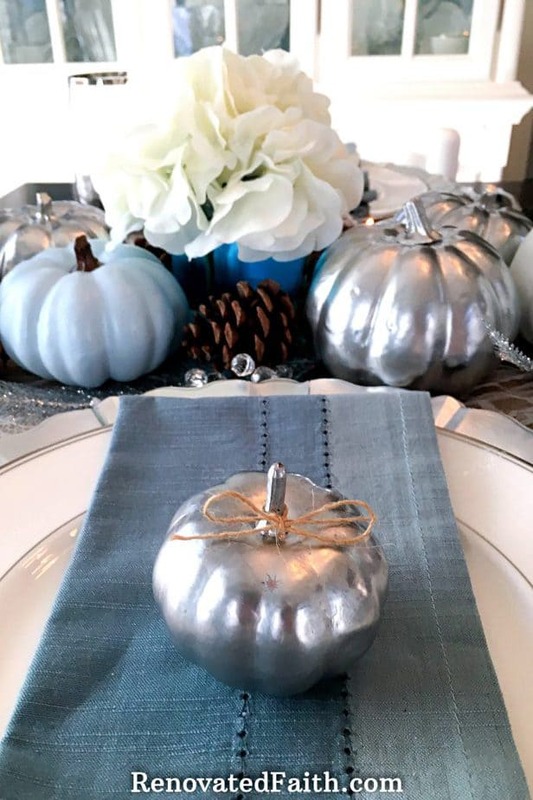 Using painted plastic pumpkins from the dollar store, I was able to customize the look of our dinner table using budget-friendly decor! 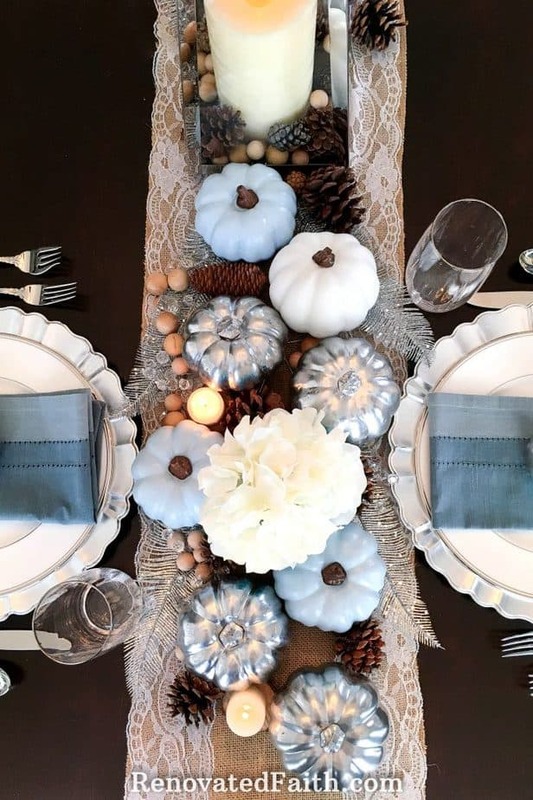 Sometimes unexpected plans give a pop of color to our lives, just like the blue pumpkins in my tablescape. Last year, I spray painted white and silver pumpkins but they still needed a little something. 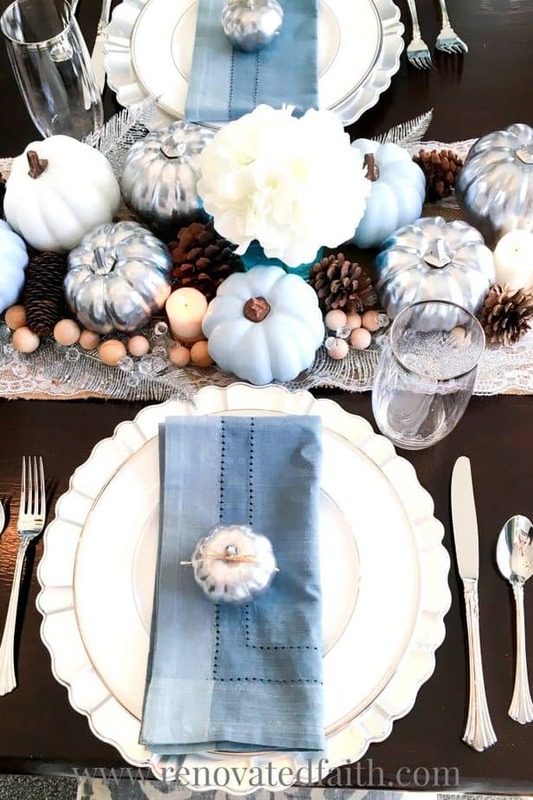 After looking through thanksgiving tablescape ideas, I decided to do something a little out of the ordinary by incorporating some blue. The pumpkins I used are just the cheap plastic ones you can find at the dollar store, a great source for inexpensive thanksgiving table decorations. My daughter Morgan helped me to paint them the same blue latex I used on the inside of my China Cabinet. We didn’t even have to sand them! This post may contain affiliate links for your convenience at no extra cost to you. See my full disclosure here. Blue Latex Paint – I used Behr Premium Plus Ultra Interior Satin in Sonata. Plastic Pumpkins from the Dollar Store. 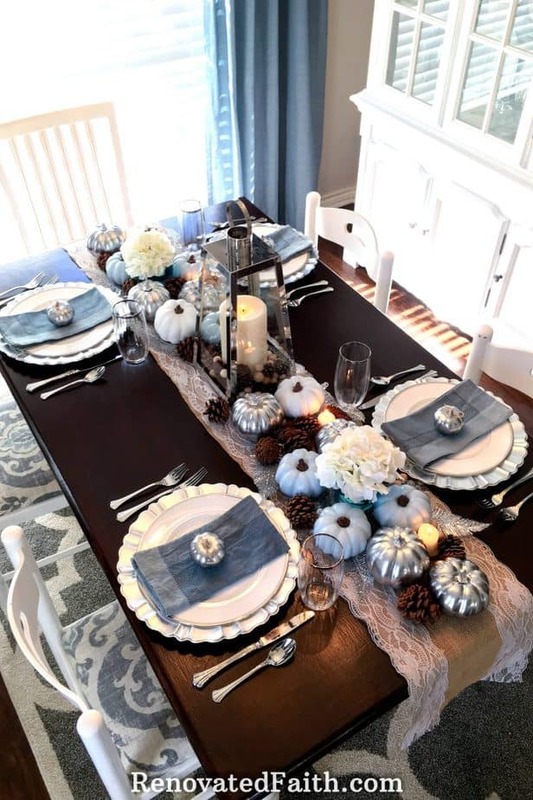 Proof that beautiful Thanksgiving table settings don’t have to be expensive! Blue vases – They are actually small glasses that each have water and one drop of blue food coloring. How’s that for being resourceful?!? Or maybe just cheap. Thank you so much for stopping by! 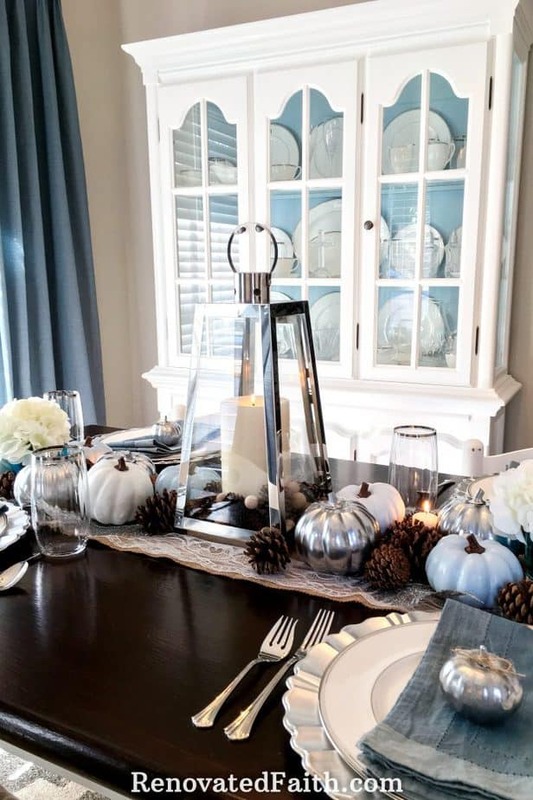 Hopefully my post has given you some Thanksgiving table setting ideas. Feel free to share this post to encourage others. 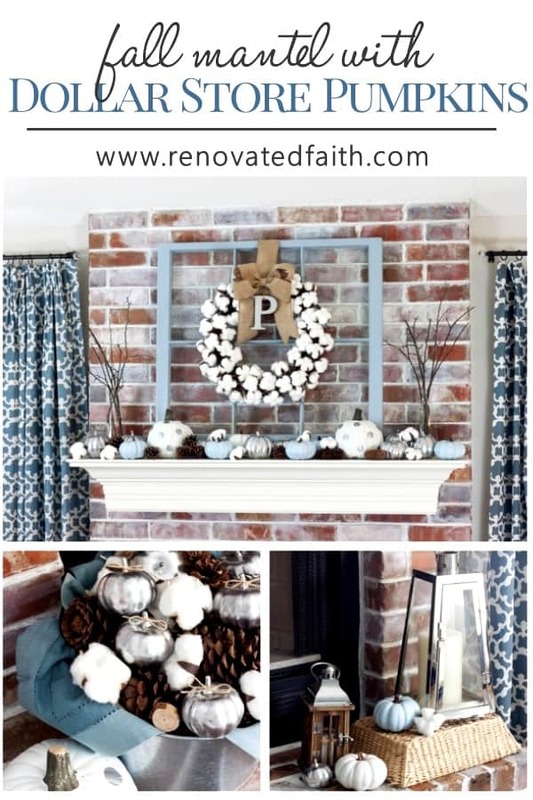 You might also like how I decorated my mantel with more blue thanksgiving decor. Check out my post here! 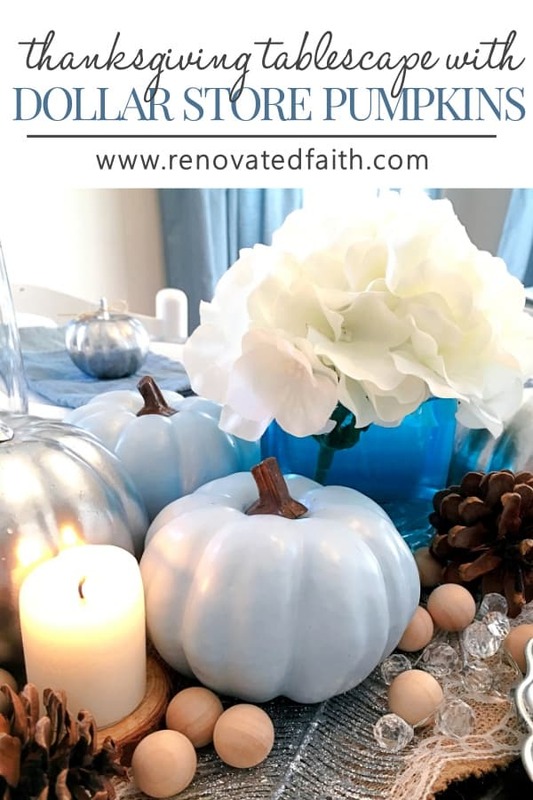 CLICK HERE to see how I made blue thanksgiving decor for my mantel out of dollar store pumpkins. This really spoke to my heart. For five years now, I have felt called to blog. I would blog here and there, but I would eventually neglect my site and pursue my own hobbies. I have spent the past week doing some major soul-searching and praying and wondering what would happen if I fully obeyed God? 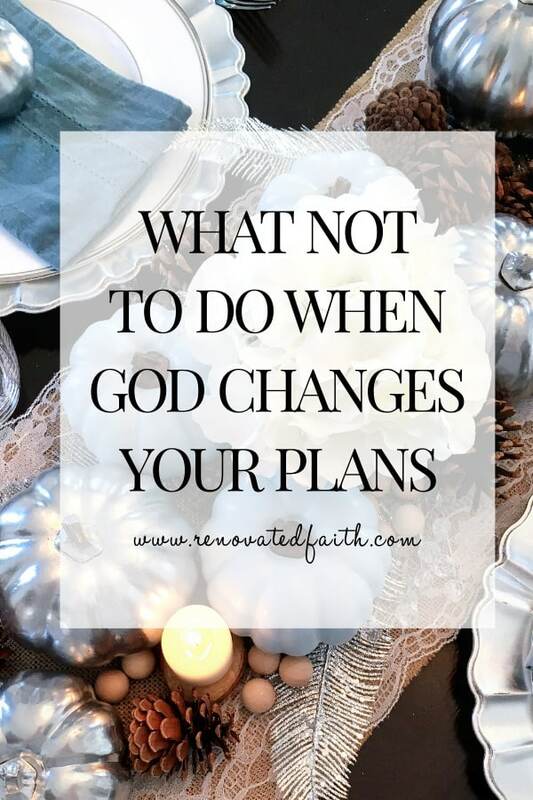 What would happen if I trusted Him and His plans for my life? I decided I would jump into blogging (and obeying) with both feet. Since I have made that decision, I have had such a wonderful peace. I know I am doing what He wants me to do. Thank you so much Melissa. I totally get how you feel. Just remember that He’s calling you to jump and He’s not going to leave you hanging. He’s going to honor your obedience to Him. Gorgeous table set up! Your table glows! Thank you so much Mihaela! It puts a smile on my face whenever I walk by. Thank you for reading my post! Love this lesson! And your blue pumpkins are beautiful! Thank you so much Abbey! I appreciate you taking time to stop by! So beautiful! I love changing up the traditional decor with something that blends so beautifully with your home. Great post! Pinned to share with our Living Our Priorities community! Thank you so much Timberley! I appreciate that! Loving this! I pinned and shared! Thank you so much Meghan! Glad you like blue pumpkins as much as I do! I love your blue pumpkins! And your words. Now you have me thinking, “What color are my pumpkins?” Lots of wisdom to ponder. Thank you! Thank you so much Joy! I appreciate your encouraging words! Great object lesson – and pretty too! Bonus! I’m glad you’ve found your calling. There is such peace in the center of God’s will! So very true Esther! Thank you for your kind words and encouragement! You do have a gift and it is inspiring to so many. It is wonderful to rest in God’s will and be used for His glory. Thank you so much Judi! I really appreciate that and I miss seeing you! Awesome post Karin! So helpful to me in this time. Thank you. (And beautiful decor, too! ).